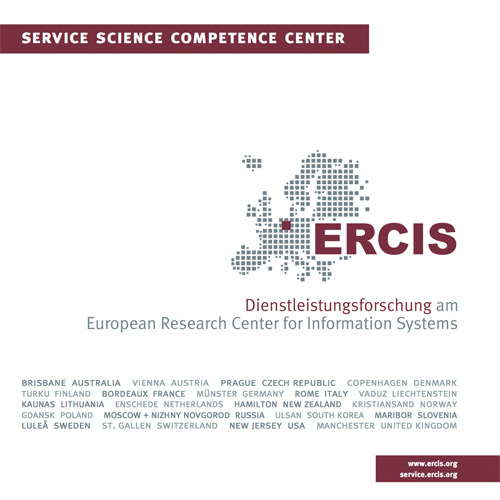 ServDEA | ERCIS Competence Center "Service Science"
A product-service-system is defined as a customized and integrated definition of goods and services to meet a customer's business needs. A good example for such a solution is a technical appliance with a guaranteed uptime. This therefore encompasses the appliance itself as well as its development, the implementation and maintenance services. However, in some cases product-service-systems can be also bought on the consumers market. A phone-contract is an excellent example: Customers buy the hardware paired with services (e.g. the helpline, voice services and data plan). Unfortunately in the business sector, product-service-systems in the appearance of highly customized products are demanded. Therefore they are aligned to the clients' needs, making them very individual in their configuration. Traditionally, ‘productivity’ is conceptualized as dividing outputs manufactured in a company by the resources consumed during their production (input). This calculus does not apply easily to service(s), since services are co-created with customers to satisfy their individual needs. In the project ServDEA we develop new conceptual approaches to measure service productivity. A central advance is utilizing the Data Envelopment Analysis (DEA) as a benchmarking approach to assess and improve the productivity of service operations. The DEA has the capability to integrate distinct performance indicators into one single evaluation by rating different subjects of study in relation to each other (non-parametric). In order to make to DEA applicable in companies, we design the software solution ServDEA that companies can easily use to benchmark their services, without a need to know all technical properties of the DEA. ServDEA enables a performance analyst to define the basic parameters of the analysis and to conceptualize a suitable productivity model that can be solved with an optimization approach. The project is conducted in close cooperation with leading manufacturing companies that have successfully established business services to augment their value propositions towards their clients. The ServDEA project is kindly supported by the German Ministry of Education and Research (promotion sign: 01FL10015). More information is available at: http://www.servdea.de.